This seasonal side dish saves you some time without skimping on flavour. Shahir’s recipe for Creamy Braised Savoy Cabbage gives you all the flavour of your traditional Christmas Brussels sprouts and bacon dish — without all of the hassle. Instead, this make-ahead dish uses cabbage to save you from all of that tedious Brussels sprouts prep. 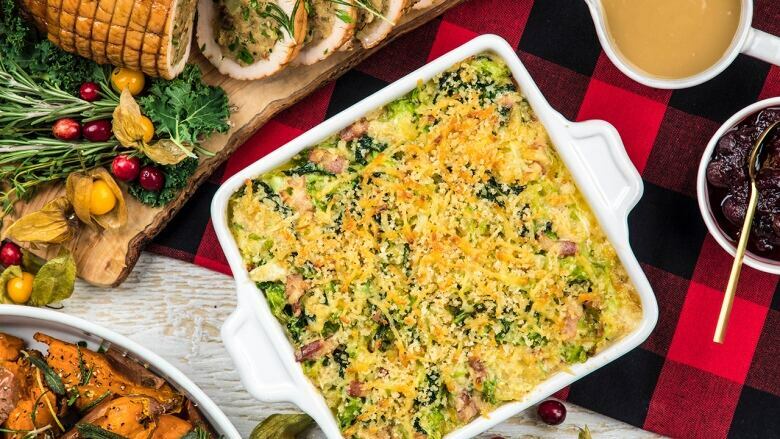 A creamy and indulgent side with plenty of veggies, this delicious dish is the perfect accompaniment to your holiday turkey. Pair it with our Make-Ahead Roasted Sweet Potatoes, and sides will be a breeze this holiday season. Add a generous pinch of salt to a large pot of water and bring to a boil. In a large, low, oven safe dutch oven, cook bacon over low heat until fat is rendered and meat is slightly crispy, about 5 minutes. Add butter and diced onions. Stir and cook until onions are soft and translucent. Do not let them brown. Add white wine to deglaze pan and use a wooden spoon to scrape any bits from the bottom of the pan. Turn off heat and set aside. To boiling salted water add prepped cabbage. Blanch for about 1 minute or until tender. Using a spider or tongs, drain off excess water and transfer cabbage to the dutch oven with bacon and onion, mix well. Return dutch oven to stovetop and add cream, nutmeg, salt and pepper and cook over medium –high heat until thickened, about 10-15 minutes. Meanwhile mix together panko crumbs, grated Gouda and olive oil. Sprinkle over the cabbage and bake at 375F for an additional 15-20 min or until topping is golden brown.